Last week on DC’s Legends of Tomorrow, Ray turned Nate Heywood (Brandon Routh, Nick Zano) into Steel with a tinkered Nazi super serum, but he cannot control it. Vixen (Maisie Richardson-Sellers) stows away on the ship, after trying to kill Mick (Dominic Purcell). She blames him for Rex Tyler’s death. Nate and Ray ended up in 17th Century Japan, and the rest of the team followed. So much fun! There were ninjas and a bit of romance. They helped defeat an evil shogun, to secure the future of Katana. DC’s Legends Of Tomorrow 2.4 “Abominations” review: A time pirate has crashed in Mississippi, 1863, smack dab in the middle of the Civil War. And there’s something wrong with him. The team goes after him. Stein (Victor Garber) doesn’t want Jax (Franz Drameh) to go. He doesn’t want him to have to see the horror of that time. They run into Henry Scott – someone who passes messages for the Union. And then comes Confederate zombies, of course. Because how can you make the Civil War even more dangerous? This was not in my history book. They attack our legends, but also kill Henry Scott, who passes his mission to Jax, and the zombies pass the virus to Mick. They look at the future and see the complete change in history. Time for a fix! Jax has to get those Confederate plans. He and Vixen are forced to watch a slave get whipped. He explains ONCE again about messing with the past, but gets chained up. He doesn’t know how to be in this time. Ray makes a zombie vaccine, that accelerates the zombie-ness. Stein is freaking the f*** out. “He was threatening enough before he was one of The Walking Dead!” True. Ray tries to get him to calm down. But Stein’s right. There is “nothing irrational” about the fear of zombies. Mick attacks and it looks hopeless. Nate and Sarah try to help with a growling zombie head. General Grant’s army will lose against the zombies. They have not been schooled in TWD or Dawn of the Dead. Whatever will our Legends do? They all put on their big girl pants and think of solutions – Sarah and Nate plan an explosive end, Ray gives Stein some courage, and Amaya and Jax free some slaves. The zombies run amok at the plantation. Jax sets them on fire, and leads the slaves to freedom. Sarah to Nate: “Think fast. Run hard. Don’t die.” Great advice. Nate takes a flare and makes the zombies chase him. He turns into Steel and sets the zombies n fire. When Sarah finds him, he is “covered in zombie guts.” I like this guy. “Professor? Was I just trying to kiss you?” Ahahahahaha!!!! I wish he was trying to kiss me! It is the episode of advice. Sarah gets advice about being a leader from Ulysses S Friggin’ Grant. Mick gives advice to Ray, and gives him Snart’s cold gun. I actually teared up. Stein tries to comfort Jax. His experience with those slaves taught him the power of human dignity. I can’t believe I enjoyed a superhero episode about zombies during the Civil War. Each character had a developing moment that was quite satisfying. 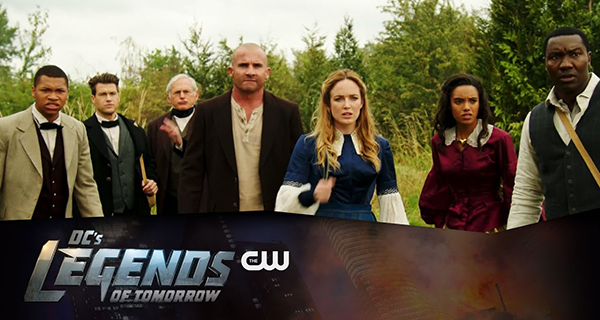 DC’s Legends of Tomorrow airs Thursday nights at 8:00pm ET on The CW. DC’s Legends of Tomorrow is new Thursdays at 8/7c on The CW, and available next day on The CW App!